John Halsey (?? - 1708) was an infamous pirate and privateer who was active on the Pirate Round and raided ships in the Atlantic and Indian Oceans. Halsey was born in Boston in the Province of Massachusetts Bay and little else is known about his early life. He is first recorded as being a privateer aboard a 10-gun brigantine named the Charles during the War of the Spanish Succession like many of the other future pirates of the 18th century. He was responsible for raiding the French fishing fleets off the coast of Newfoundland. The crew later sailed to the Azores Islands and the port of Faval before continuing onto the Canary Islands where they attacked a group of Spanish merchants on their way to Barcelona in 1704. When the crew arrived at the Cape Verde Islands some of the crew would desert however, they would be returned to Halsey by the local Portuguese governor who saw his privateering license as valid. However, the letter of marque was due to expire the following year so the crew set sail to the pirate haven of Madagascar. Sailing past the Cape of Good Hope and the Dutch Cape Colony they headed for Augustine Bay in order to take on water and supplies. Encountering several shipwrecked sailors from the Degrave, Halsey bolstered his crew and sailed for the Red Sea in search of treasure laden Indian ships. In 1706 the Charles spotted a massive Dutch East India Company ship which they decided not to attack. 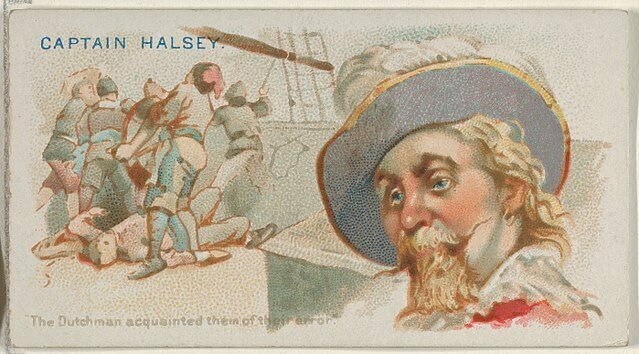 However, like many other pirates who chose not to attack fellow Europeans, the Halsey and the gunner of the ship were removed from their posts by popular demand and the crew moved into attack. However, the Dutch ship was very well armed and as the pirates approached the Dutch vessel fired a warning shot which injured a crew member at the wheel and destroyed one of the swivel guns. The crew fled to the hold following the warning shot and the Charles managed to retreat. Halsey was given command of the ship back after the incident and they managed to capture two local coastal merchants off the Nicobar Islands in February of 1707. Next the Charles sailed into the Straits of Malacca but the moral of the pirate crew was low following the failure at capturing the Dutch ship and they ended up returning to Madagascar. It was here that Halsey would recruit another pirate crew including Nathaniel North as his quartermaster. The new crew of the Charles set sail for Mocha but quickly encountered five heavily armed British man-o-wars in August of 1707. However, deciding not to back down the Charles engaged the ships and despite having 62 total cannons directed at them the pirates eventually beat the British at the naval engagement and forced the ships to break formation and sail off. The largest ship managed to escape but Halsey and the crew ended up capturing two of them and looting and estimated £50,000 in coins and trade goods. "He was brave in his Person, courteous to all his Prisoners, lived beloved, and died regretted by his own People. His Grave was made in a garden of watermelons, and fenced in with Palisades to prevent his being rooted up by wild Hogs." 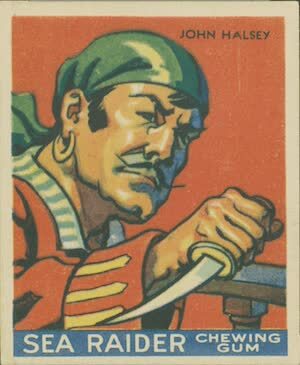 Some of John Halsey's crew would later join Christopher Condent's crew on the second pirate round. They provided him with valuable advice handed down from the first pirate round and allowed him to be successful in capturing a massive treasure laden Arab ship.